How Much Does It Cost To Travel Around The World On A Bicycle? How much does it cost to travel around the world on a bicycle? Here are some practical bicycle touring tips on reducing your travel costs, so you can go cycling RTW for longer! How Much to Travel Around the World on a Bicycle? People often ask me how much does it cost to travel around the world on a bicycle. My answer is that it will cost as little or as much as you like! That's because there is no one answer to the question, as everyone approaches bicycle touring differently. Some people might like to stay in hotels for the majority of nights. Others will steadfastly refuse to pay for any accommodation, and wild camp 100 percent of the time. Personally, I can cycle reasonably comfortably on an average of £10 a day. (That's cycling on $15 a day if using dollars is easier for you!). Now, you will often read about how someone cycled around the world on 3 dollars a day, or how someone spent say just £8000 on four years of travel. Let's take a reality check. These people are either being economical with the truth, have a diet that would frighten nutritionists, or did a heck of a lot of freeloading. My personal experience is that £10 a day is about right. This allows the more expensive countries to be averaged out with the cheaper ones. Its a realistic number that allows for a few treats every now and again, or for emergencies like having to buy a new rear wheel or derailleur. Even $15 a day is too cheap, right? Most people who have never undertaken a long distance cycling tour before, will think that £10 or $15 dollars a day is still incredibly cheap. Duh… that's why I do it folks!! I can spend less in three months travel than some people spend on a two week vacation overseas! It's one of the reasons that cycling around the world appeals to me so much. So, how exactly can I get by on £10 a day? Firstly, that figure assumes that I have already bought the bike and all the kit that I need. Sure, bits will need replacing from time to time, especially items of clothing. Generally speaking however, the £10 a day budget allows for most of this. With the kit already bought, that just leaves the daily living expenses, which are accommodation, food, and treats. The vast majority of cyclists pedalling their way around the world will carry a tent with them. By either choosing to wild camp, or stay in a camp site, accommodation costs are greatly reduced. Even by wild camping for five days in a week, it might be possible to stay in cheap digs for two days a week. This provides time to sort kit out, wash clothes, update blogs and all the other things that inevitably need to get done. In some countries such as South America and Asia, accommodation can cost as little as $5 a night. With this being the case, it often makes sense no to use the tent at all. Why not enjoy a few affordable creature comforts, albeit not in the Ritz! 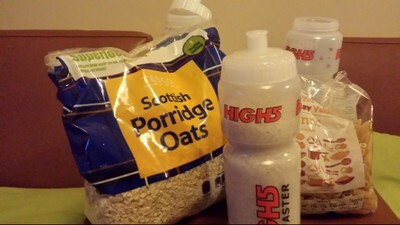 In a way, food is more important to a long distance bicycle tourer than accommodation. After all, if the body isn't fuelled properly, the wheels don't get turned! 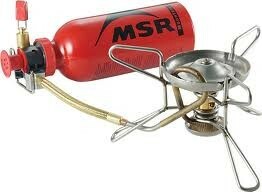 Most cyclists will carry cooking gear such as a camping stove with them. They will also have a few days food supplies so that they can wild camp at will. Preparing food yourself is a huge money saver. The basics such as pasta, rice and oats cost very little, even in the most expensive countries. Throw in a few in-season veggies and greens, as well as tinned fish or meat, and a pretty well balanced diet for very little cash can be had. In some countries though (especially Thailand), it is almost impossible to cook for yourself cheaper than it is to buy street food. Even if it is cheaper to cook yourself, the cost of a fully prepared meal with a variety of ingredients will offer better value in these countries. Again, its not about living like a skinflint, it's about making what money you have work the best for you. This is the part where most people fall down. The main treat that people get carried away with is alcohol. A beer at the end of a hard days bike ride might seem a nice reward. Have more than a couple, and the budget starts to get blown to pieces. (Note – I stopped drinking completely in October 2015). Another example of a treat that can get out of hand, is paying for internet access. Unless there is a genuine need, try to avoid logging onto the internet once a day (or several times!). Most people should be able to live without seeing what amusing pictures of cats have been posted on Facebook for a week or more at a time. Its far better to take advantage of free internet access when available rather than paying for it at every opportunity. The same applies for calling home to family and friends, especially from a mobile phone. So then, how much does it cost to cycle around the world? It all comes down to the individual, but I hope I have shown that it is possibly the most economical way of travelling there is. £10 a day goes a long way as a cyclist, and of course, the most important thing to remember, is that the less that gets spent, the longer a trip will be! I will leave you with a couple of equations that I subconsciously follow, and would love to hear from you in regards to how much you think it should cost to cycle around the world. I think that cost per day can be misleading. Sure maybe $15.00 per day cash, but if you factor in the cost of all your gear that you have with you and then average it out that might show more of the true cost of bike touring. I mentioned in the post that the cost does not include anything that was purchased throughout the trip (the bike, tent etc). However, the cost does include any spare parts and extra equipment purchased during my trips. This has on occasion included derailleurs, tents, cameras etc. So with this in mind, I believe this is a fair reflection of what the true cost of touring has been for myself for my bigger, long distance cycling expeditions. I noticed you have a Vaude Hogan tent. Just wondering about the durability of the shock-cord holding up the fly. I have the Vaude Hogan XT, seems way too narrow for the 4kg weight. It is as wide as my Big Agnes Fly Creek (1 person, weighs 1.1kg). Spending a year in South America with my wife. Lots of hard UV on the altiplano to destroy dainty shock cord with. 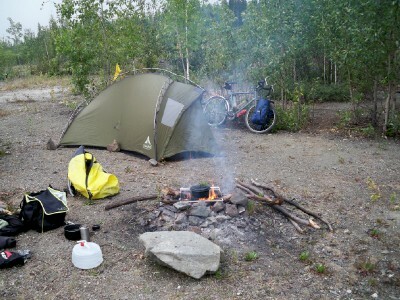 My first tent was a Vaude Hogan – and the build quality was excellent. After 10 years of use, it finished the end of it’s life, and so I decided to replace it with like for like for my Alaska to Argentina cycling trip. Big mistake! In those 10 years the quality had gone down the pan! It didn’t even last as long as the end of the United States. For the rest of the trip, I made do with a 40 dollar tent which actually did the job very well! The issue wasn’t in the shock cord – it was with the poles and fabric. For this reason, I would not recommend buying one to use. Of course, if you already have it that’s a different story. Going by just weight and size – If you have the Fly Creek which weighs in at less and has the same space, i would take that. Many people use the Hubba Hubba (http://amzn.to/1TOVUcx) – The price puts me off though. For the altiplano – I would also pay some thought to the sleeping bags. It gets cold enough to freeze water bottles on the inside of a tent sometimes! I ended up buying an extra blanket to carry around with me. Wishing you both pleasant tailwinds and lots of downhill sections on your trip!! Great post Dave. We met quite a few people who where bicycling all the way from the US to the tip of South America. I would probably give up after a few miles, so I have the utmost respect for people who are traveling the world on a bicycle. It can be quite addictive – so if you start, be prepared for it to change your life! I would agree, a tenner a day sounds about right. We managed Europe on about £12 each per day, less developed parts of the world on £6 per day, wild camping or staying with Couchsurf/Warm Showers hosts most of the time and cooking on our stove but eating very well. I think the next database should be a “calories consumed per km/per month” one!! I was wondering – Do you buy insurance on top of your daily budget or just risk it? I’ve been unable to find cheap insurance as bike touring is an ‘extreme sport’. Also, you obviously have visas on top of your daily budget too – does that add much? Great to hear you are planning your own trip, and hopefully our tracks will cross! You raise a good point in regards to insurance. For my last trip, I took out a years insurance, which covered me through the potentially expensive north american part of the route. For the rest of the time, I didn’t have any. If it came to claiming on hospital bills, I would just not have made mention that I was travelling by bicycle. For my next trip, I am debating over insurance or not – It’s something that I am going to be looking into over the next few months, and I’ll certainly share whatever info I get hold of in regards to policies and costs etc. The daily budget – Does take into account visas as well. These will vary from country to country though, as some will be expensive but others cheaper. I’d be interested to know who you ended up using for travel insurance. Planning a Europe/Asia cycle tour and finding it difficult to find the best (or anything) that will cover me. Travel insurance for bicycle touring is one of those things where you are never sure if you are quite covered or not! I honestly can’t remember the name of the insurance I had last time. I believe I got regular ‘backpackers’ insurance. For the last two trips, I didn’t have any. I had contemplated organising a cycling trip – thank you so much for your insights and tips! I had a dream about cycling to Africa once, but I’m sure I couldn’t do it for anything near £10 a day. As you say – the cost varies from one individual to the other. I am about to bike around the four corners of Scotland, and next April take off for a RTW trip. I’ll let you know costs etc. Do you have a blog? Would love to follow your journeys ! Great to read this. I am sure it is true and it means I can go on my own tour for a very long long time. $15 a day sounds super reasonable, I spend less than that a day just living in Mexico, heh. I’m sure it’s easy to survive on that. Now if you cycling just through The Western EU you might not be able to get away with it heh. All I can say is ‘Wow!’ Cycling around the world! What a simplistic immersive way to travel. And for only $15 a day…who would’ve thought. Great post thanks for sharing.